In this modern lifestyle computer has become an integral part of pour life be it in the office or at home. It is becoming unimaginable to live without computer in this world. Even small things in our workplace or home require computer and we are becoming dependent on computer for every small thing in our life. But if we do not use it wisely it might prove harmful to our health. There are many health problems which are arising in human beings due to excessive and improper use of computer. SO let us check out what all health problems it can create for us in life and what can we do to fight these health problems. Hanging your laptop bag in a wrong way or working on computer for a long time can cause sprain in your neck or throat, shoulder and lower and upper back pain might also occur in the muscles. Wrong sitting posture can cause pain in the neck too. Most of the time the elbows remain in the air without any support, which causes muscles of neck and shoulder to shrink and can result in Cervical Spondylitis. Typing too fast on the key board, using mouse or track ball continuously for long time has bad effect on the tendons, tissues and the nerves of the body. In order to save your body from all these muscular pains you should exercise regularly. You should move your shoulder everyday in clockwise and anti clockwise circular motion everyday 20-30 times. Move your head from right to left at least 10-15 times in a day. Look towards sky for few minutes and relax after watching the sky. 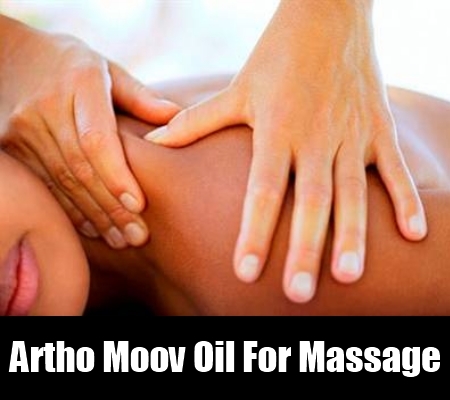 You can also take some ayurvedic medicines too like Arthomoov tablets or artho moov oil for massage. Most of the time we spend sitting in front of the computer which affects our eyes very badly. Computer vision syndrome is a kind of problem in our eyes, which occurs because of using low quality monitors. 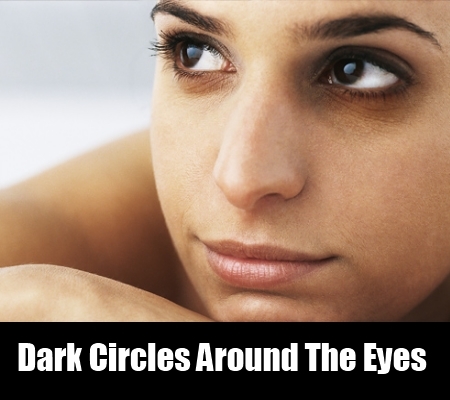 If you work on computer for long hours then you will face the problem of dark circles around the eyes, dryness in the eyes, irritation in the eyes, blurred vision, unable to focus and pain in the muscles around the eyes and all these might result in severe headaches too. Key board is also another reason which strain s our eyes. While typing people look at the key board and the screen again and again which strains their eyes too much. Black key board and the br8ight screen of the computer are opposite to each other and looking back and forth at them created strain on your eyes which increases the problem. While working the distance between the eyes and the screen should be at least 25 inches. The work place should be properly lighted. Try to check that the height of your chair is also proper. The brightness of the computer screen should be according to the computer. After every hour take a break for ten minutes to rest your body and eyes. While working on the computer increase the text size. 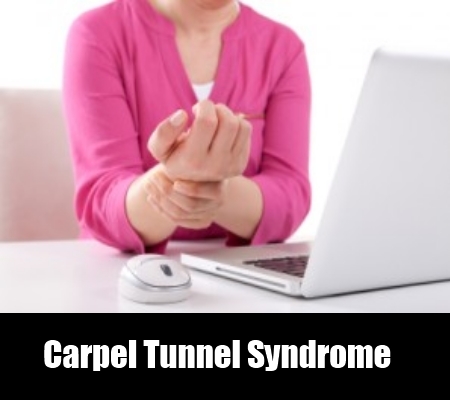 Too much of typing creates repetitive stress injury in the median nerve which can cause carpus tunnel syndrome. This results in swelling in the wrist and causes pain in the nerves of that area due to too much pressure on the nerves. Due to this syndrome there is continuous pain in the fingers, hands start shivering. A motor skill of holding something by the hand also gets affected and many a times the whole hand and muscle s become weak. While typing keep the position of your hands correct. 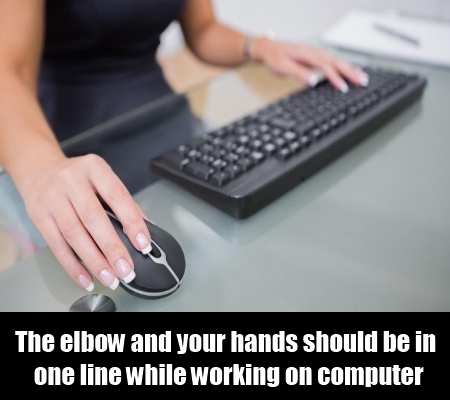 The elbow and your hands should be in one line. The elbow should not bend in one direction. In between typing your should exercise your wrists by moving them clockwise and anticlockwise after every one hour for 15-20 times. This will rest the muscles around wrist. You can also move your wrist up and down at 15 degrees angle. Try to change the position of your wrist after some time so that it does not become stiff. 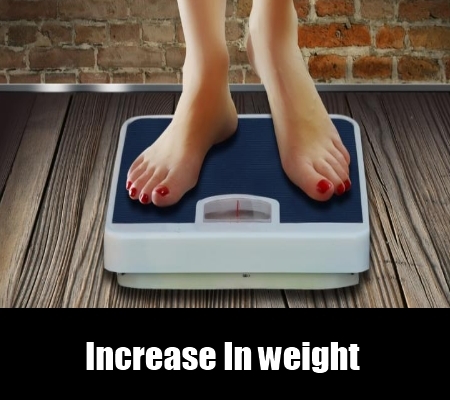 People who work on computer start suffering from weight gain very quickly, because of their sedentary habits. They have to sit and work all the time and this causes the increase in stress in the body which results in increase in blood sugar and hormonal changes in the body very quickly. This sends signal to the brain that we are tired and require energy and thus we start eating more. If you want to stay fit and slim while working on computer then exercising regularly and keeping control on your diet is very important. 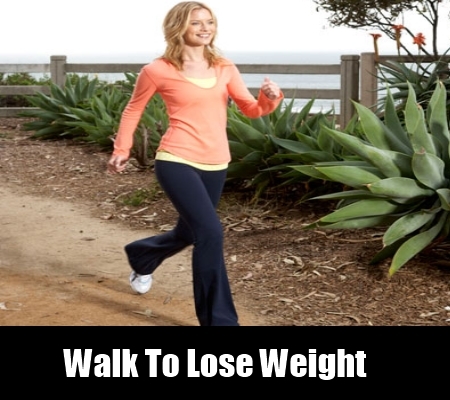 Stop munching while working on computer, take break and take a short walk in between long hours of work it will help. Remove the old computer and use LCD monitors for your computer. 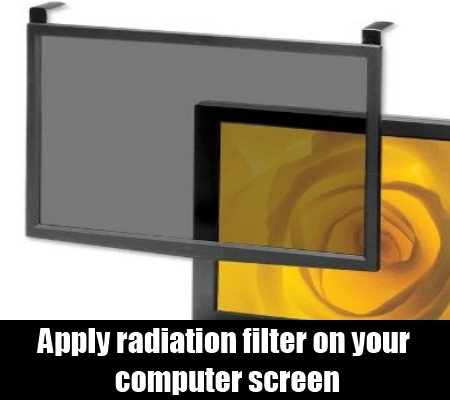 Apply radiation filter on your computer screen to stop the harmful radiations emitted form the screen. Do not keep anything metallic near the computer. Keeping the metallic things around will produce electromagnetic radiations which are harmful for us. Adjust the screen brightness so that it does not strain your eyes. The brighter the screen is the more radiations it will emit. The ideal distance from the screen should be 50 -75 centimetres. After working on computer for 20 minutes close your eyes for 2 minutes. This will rest your eyes. While resting your can come out and look at the sky this will expose your to the natural environment and relax your eyes too. Every morning get up early and fill your mouth with water and splash lot of cold water on your eyes. This will relax your eyes. Never work on computer late at night. Never keep the laptop on your lap for long time. Keep the lap top in such a place where you keep your desk top. Use mouse for less time working on mouse is bad for wrist and arm.